"You are a priest forever, in the order of Melchizedek," we read in Hebrews 7:17, which is also making reference to Psalm 110. These past seven weeks serving as a priest have been a humbling, and wonderful time. 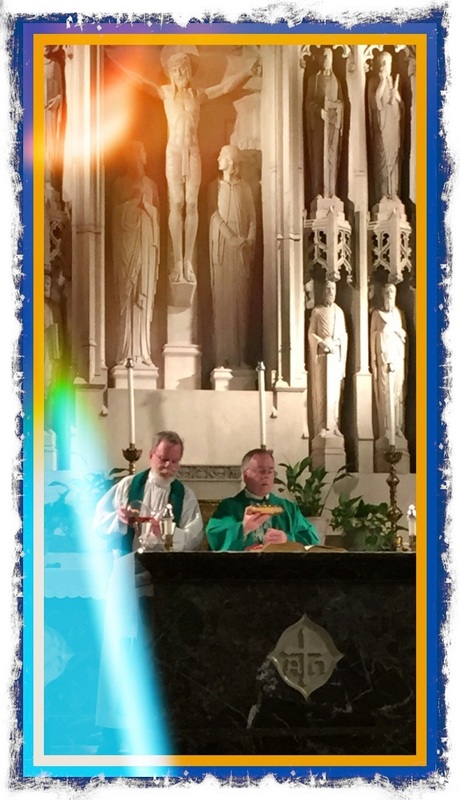 I was so very blessed to be surrounded by my family and friends at the Cathedral in Trenton on June 6th, and repeatedly at parishes where I was able to celebrate Masses of Thanksgiving. It is sort of funny, actually, how often these same people have asked me during this past month and a half, "How are you doing?" and "Are they taking care of you?" The answers are easy: doing great, and yes, I am well taken care of; that last question is perhaps best answered with another question I hear from my pastor almost every day, when he asks, "Is there anything you need?" To serve as a parish priest is truly a joy. Since that beautiful day a few weeks ago, my ministry has included the opportunities to offer the celebration of the Mass, to celebrate the sacrament of Reconciliation, to preside at a marriage, to visit and anoint the sick in their homes and in hospitals, to meet with parishioners to offer spiritual direction, and to celebrate funeral rites. Truth be told, I did not expect that my first funeral homily as a priest would be for my Dad, but through the grace of God he was with me at Ordination and for those initial Masses, the blessed answer to his prayer of these past few years that he simply lived to see me ordained; God is good! Being back in the neighborhood where I spent almost three decades as a married man, raising my sons and serving as a deacon in those last years, it is surprisingly comfortable. I had expected some awkwardness as parishioners and old friends got used to my new role, but that has not been there at all. The wonderful kindness by which I have been welcomed "home" has touched me every day. I am sure there will be difficult days in my ministry, after all, priests are called to be part of a "crisis management team." In my business career, I spent thirty years helping companies plan for catastrophic events, and to help them avoid letting everyday challenges become a crisis. As a parish priest, I have been welcomed into homes as people are crying, and I have shed tears with them. Those who have known my ministerial focus for the past decade know that growing into a deeper relationship with Jesus requires a deepening of prayer time, and a maturity in how we pray. This past week, I met with a group of 5th grade RE students, and we spoke of how a vocation is different from a job; whether we are called to a life that includes being single, married, or perhaps a religious or ordained person, the foundation which separates a "job" from a "vocation" is the role of prayer. It is a blessing when we can make every moment one of prayer. One of the most important elements of our celebrating the Eucharist includes the short prayers offered when the gifts of bread and wine - no wheat and grapes - are offered back to God: "...fruit of the earth/vine and work of human hands." God doesn't need grapes or wheat, nor bread or wine. God desires that the work of our hands throughout each week be done to the best of our ability, with faithfulness to the Gospel. When we do this and present back to God each week the work of our hands and mind, we have the chance to make our work our prayer. We have the chance to "Go in peace, glorifying the Lord by your life."